When I read an e-mail about Mustang Brewing Company’s new Saddlebag Series, I found myself intrigued. I’ve had various offerings from Mustang before, some of them I’ve liked and others less so. My overall impression of Mustang’s standard line-up is that it is preferable at times to some of Boulevard’s offerings depending on the beers, like Mustang’s Washita Wheat, which is enjoyable and light. I’ve also told my husband that if he’s going to buy me a grocery store beer on a Sunday to grab a six pack of Mustang’s 33. It’s is a fairly palatable 3.2 beer compared to what is usually found in most grocery chains these days. But after meeting up with brewmaster Gary Shellman and marketing director Eric Pennell, I have to say Brandy’s Imperial Sundae has changed my mind about what Mustang is capable of producing. I would have never dreamed they’d make a richly-infused vanilla porter. To be honest, most of Mustang’s offerings so far have been pretty tame when compared to some of the bolder flavors produced by other local breweries. For example, there’s Battered Boars’s Heartbreak Hefeweizen or COOP’s DNR just to name two. Mustang typically sticks to lagers, pale ales, and golden ales. These are not bad styles, they’re just not typically known for having a huge kick in the flavor department. I discussed this with Shellman and Pennell, and it turns out the brewery wanted to be firmly established with its proven sellers before introducing more daring choices. It makes sense financially. Now that their brand is gaining steady recognition, word has it that Mustang may have its own large-scale brew house by the end of the year. Currently they brew in other facilities in and outside of Oklahoma, which is not unlike what some of the newer breweries are doing as well. Even so, it seems like now is an exciting time to jump into the local market, because in Oklahoma City it appears the demand for quality craft beer is growing by leaps and bounds. At any rate, Shellman says he’s been working on the recipe for this unique porter for a few years now. Originally it was inspired by another brewer named Denny Conn, but Shellman tweaked the original recipe by using organic vanilla beans and brandy infused oak chips. The result is delicious and so completely different than their other beers. 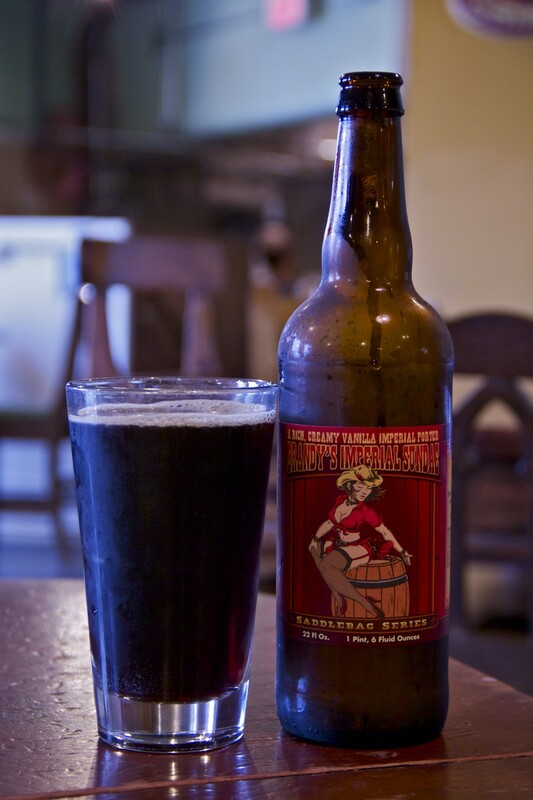 This porter is brewed and distributed in Oklahoma. And to the best of my knowledge, we’re the only state it’s been made available to. This porter has a beautifully dark amber appearance. Originally it was served to me in a pint glass at McNellie’s in Midtown at $16 for a 22 ounce bottle. This same bottle can be purchased for just under $9 at liquor stores. That said, in the pint glass this porter had a medium head that dissipated quickly. There was some moderate lacing. The first scent that hit my nose was vanilla. There’s a subtle hint of dark chocolate before the scent of brandy cuts in. It tastes creamy. Oh, so creamy. Vanilla is ever present on the forward before the flavors meld into that dark chocolate. There’s a light bite of brandy, but overall this beer finishes with a strong vanilla aftertaste. As for the mouth feel? It is velvety, but not too heavy and cloying. There’s a good reason Mustang calls it a sundae given all the flavors going on. Pennell said Local, a restaurant in Norman, made a beer float using a single scoop of homemade vanilla ice cream and this porter. It is indeed a logical pairing. It will be interesting to see how this beer bottle ages. Some beers that are strong, such as this porter, can be aged. This is not true of all beer of course, but generally, as it ages the flavor profile changes in subtle ways. I’ve already got a bottle stowed away just for this purpose. I’m betting the vanilla will tone down a bit and it maybe a little sweeter, but only time will tell. Speaking of which, Brandy’s Imperial Sundae will not be on the shelves long. Mustang is only distributing 1,500 bottles. The first week it was out retailers had trouble keeping it on the shelves, so it is probably worth the time to call around to see who has it in stock. Broadway Wine Merchants and Byrons, last I checked, had bottles for sale. Shellman says the Saddlebag Series will have more additions. So far they have six planned. The next one Mustang plans to release is an Imperial Russian Stout with an undisclosed fruit in it. I tried to get Shellman to tell me, but he chose to be mysterious and said that my guess of cherries was wrong. He was, however, not mysterious about the IPA that’s coming out in the Spring. It will be infused with chili peppers. Mustang Brewing Company’s Brandy Imperial Sundae. Label art by Thom Shelf, an artist who also designs concert posters for the Tulsa music venue Cain’s Ballroom. While I am no equestrian, the Internet assures me that a mustang is essentially a wild horse. For some time, Mustang Brewing Company, which has focused on delivering a solid offering of easy drinking, if tame, session beer has seemed anything but wild. However, bucking that trend, Brandy’s Imperial Sundae just sauntered out swinging and socked some sense into me when it came to my thoughts on what Mustang Brewing Company is capable of. As far as looks go you can’t expect much better from a porter. The beer pours a very dark brown with good clarity that allows for that oh so pleasant gradation of light to play out as the beer stretches to the bottom of your glass. A half inch of off white head quickly dissolved into a fairly persistent ring of foam with moderate lacing. The smell of this beer alone should compel nearly anyone to its consumption. I felt that there was much more than a hint of chocolate on the nose, with some more subdued vanilla notes. However the real olfactory seducer was a veritable bouquet of brandy that tempted me to taste… and oh does she taste. Get ready for a subtly carbonated silken wall of somewhat bitter dark chocolate that at times takes on an almost powdery cocoa dryness without ever becoming so cheap. Lesser notes of caramel, raisins, and coffee may be teased from the dominant chocolate barrage. If the promise of an Imperial hopocalypse brought you here, be warned that we are looking at only 40 IBUs, which complement the main flavors in a way that downplays their bittering power. The organic vanilla weaves in and out of the prolonged chocolate note, and a sturdy malt backbone props the whole thing up. Surprisingly, while very present in the nose, I could taste only a hint of brandy. Instead, the booze soaked oak lends more of its woody character near the end before warming slightly as if to give you a quiet reminder that you are drinking a 9% ABV beer. Understandably, the finish is anything but clean, and will leave you licking sweet, satisfying, dessert from your teeth for some time. While my description may make it seem like this is a very busy beer, the flavors meld in a very even and familiar manner. The final product should be instantly palatable to beer drinkers, and perhaps non-beer drinkers, of varied tasting experience while still rewarding the seasoned sipper. In other words, at 22oz’s and $9 a bottle, you can and should share some with a friend. Tagged Battered Boars Heartbreak Hefeweizen, beer, Brandy Imperial Sundae, Cain Ballroom, Denny Conn, Eric Pennell, Mustang Brewing Company, OKC, Origin Mustang, Saddlebag Series, Style Porter. Bookmark the permalink. Fantastic review Ms. Grant! I’m enjoying a B.I.S. as I type this and am enjoying it thoroughly. My favorite vanilla porter is produced by Breckenridge Brewery and is divine. This offering from Mustang is giving that porter a run for its money. Very well done Mustang. Very well done indeed.